This classic line spoken by Ray Liotta, opens Goodfellas and your trip into the violent and not so romantic birds eye view into the American Mafia. Directed by Martin Scorcese and starring Ray Liotta, Robert DeNiro, Joe Pesci and Lorraine Braco, this stellar cast is amazingly convincing in their portrayal of their respective characters. Gritty, violent and compelling, the quality of this movie earned Goodfellas six Academy Award nominations including Best Picture and Best Director. Younger actors Pesci and Liotta are welll guided under the expert tutelage of two time Oscar winner DeNiro, spurring their performance to even greater heights. Possibly the only drawback to this disc is the lack of any extras other than trailers. 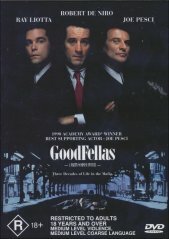 Goodfellas is a must own DVD for any lover of great Mob movies.